Check out our top 10 (and growing!) list for just a few of the many fun, relaxing, entertaining and delicious things to see and do on unspoiled, unhurried Bonaire! While thousands of experienced scuba enthusiasts come to Bonaire every year there are also those that have never practiced the sport before and want to give it a try. The tranquil seas and excellent visibility underwater make Bonaire the perfect spot for beginners and those wanting to improve their skills. 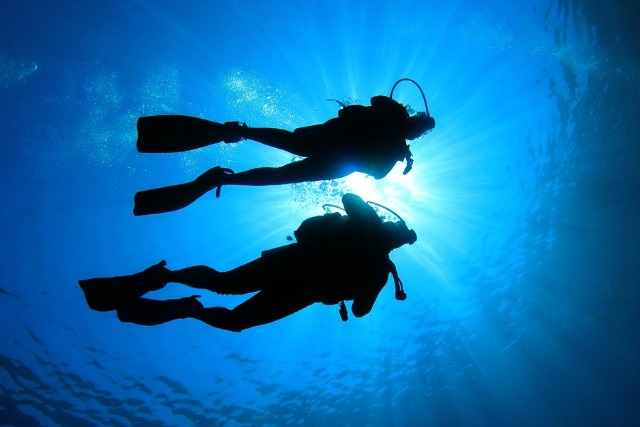 Check with your dive operator of choice for which dive certification courses are right for you. You can even take a snorkeling course if you’ve never done that before. If you just want to get a quick taste of diving, a one day “Discover SCUBA” course is an option or you can go for your open water SCUBA certification to begin diving regularly. If you are considering coming to Bonaire to dive and want to save time once on the island you can do the theory portion and exams of the PADI e-learning program online BEFORE you travel and just the practical sessions and dives at Div’Ocean or the dive center of your choice. Already have your open water? You can take intermediate and advanced SCUBA courses including specialties like NITROX, wreck, navigation and night diving. Dive Master training and courses in Technical Diving are also available. What about the kids? Children age 10 and up can already begin with either a one day “Discover SCUBA” course or junior open water certification courses. Ask your dive center for details. The Hangout Beach Bar at Jibe City opens up around 8am for coffee and sometimes Dutch apple pie and stays open for meals until around 5pm. After that they serve drinks on the beach until all the guests have gone home – usually not too late. 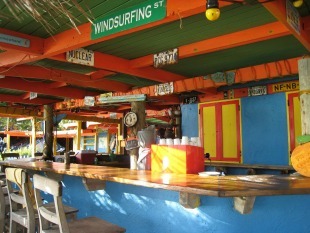 Great place to have lunch while windsurfing and always with the absolute best views on the island. The hangout bar serves salads, sandwiches and burgers and even brings food and drinks out to you at the beach if you prefer to never leave your lounge chair. This is an often recommended spot for divers on their last day on the island as something to do on their day off of diving. 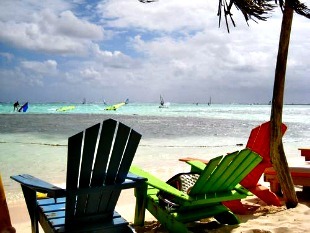 The perfect spot to watch pro windsurfers in action and enjoy a piña colada on a sunny beach day. On days with no wind take your mask and snorkel and walk all the way across Lac Bay for a snorkel at the edge of the reef, where Lac Bay meets the sea. Searching for something off the beaten path? Love hiking? Take a drive into the Washington Slagbaai National Park and climb Mt. 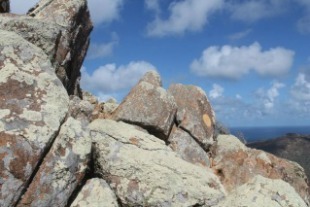 Brandaris, the highest peak on the island of Bonaire. 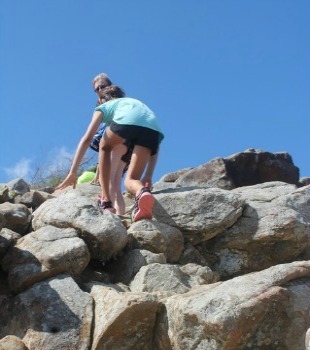 It’s a difficult, yet not so difficult climb- the peak is at 784 feet and only takes about a half hour to reach if you are moderately fit and not too too scared of heights. The views from the top and along the way make it worth the effort. But there are no guard rails, trail is not super well marked and it’s a steep, hand over foot climb as you near the summit. Just a few faded yellow dots painted onto rocks mark the way. Tips: Be at the entrance to the climb by 12 noon at the latest as per park rules. Bring plenty of water, wear a sun visor and appropriate shoes. Exiting the park you have quite a long rough road ahead of you. Leave enough time for a stop at Wayaka II beach on the way out and enjoy the island’s most beautiful, isolated spot to cool off after your hike. Bring snacks and/or picnic lunch. Also keep in mind if you want to visit the parks other beaches by taking the “long route” – that should probably be saved for a separate day trip. “Best Local Food” is painted on the sign as you enter this rustic off-the-beaten path little gem and “best local food” it is. 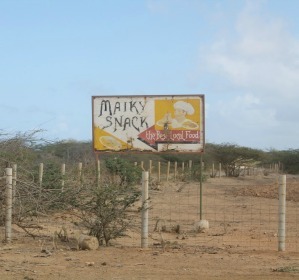 After eating at Maiky Snack you’ll go home satisfied you’ve experienced a little taste of local life. 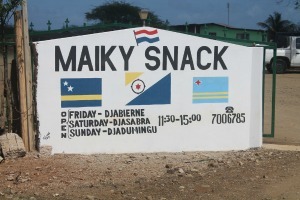 Plan ahead because Maiky Snack is only open Friday, Saturday and Sunday 11:30 – 3:30. Prior to 2015 hours were 6 days per week, so now more than ever you will notice Maiky’s is filled with locals on their lunch breaks and tourists in the know. It is a little out of the way but that only adds to the fun and flavor. 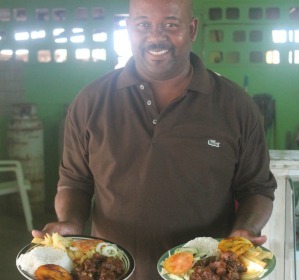 The hours of operation, difficulty in finding it, (turn left at the big billboard sign and then left again at the almost impossible to see blue rocks…), the menu in Papiamento scribbled on the blackboard and, add to that the unusual cuisine itself – goat stew, blood sausage, tutu anyone… combine to make this the complete package of must do local stops on your Bonaire itinerary. So what to order? 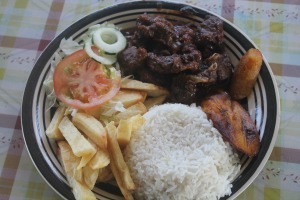 This is THE place to try goat stew – on the chalkboard menu at Maiky’s it’s called cabritu stoba. The word stoba means stew in Papiamento. You may find papaya stoba on the menu which sounds vegetarian but it’s actually another version of goat stew, this time mixed with green papaya. Snijboonchi stoba (bean stew) likewise, is also not vegetarian – it’s stew of green beans with goat. Our personal favorite is the traditional cabritu stoba and a mix of the funchi (corn meal similar to polenta) or preferably tutu which is a sweeter version of the polenta made with black beans. Aros (white rice) and batata (thick cut fried potatoes) are also side options and all dishes are served with a couple of fried plantains and a small lettuce, tomato and cucumber salad. Portions tend to be large. Choice of soft drinks, Polar, the local(ish) beer or Heineken in bottles. You can ask for a pitcher of water if you prefer. Seating is in rustic tables in the shade and with a breeze and it could not be more relaxed. No dessert or coffee served. This place is all about the goat. (Although the fresh fish is good too.) Interestingly and for some, disturbingly, goats (and sometimes cats, chickens and iguanas) wander freely around the parking lot while you eat. So let’s call the setting casual. We love it. Insider tip: get there early as they can and do run out of food by the afternoon. Expect to pay about $13 – $15 per person. P.S. It’s really, really local. Most days owner Maiky himself is there taking orders and working the grill. The goat doesn’t come from very far away either… An island favorite for a reason. Just a few short years ago the kiters and windsurfers were vying for the the right to use the tranquil waters of Lac Bay, Sorobon Beach on the southeast corner of the island. Lac Bay is officially reserved exclusively for windsurfing since the area is simply too small to fit both sets of athletes. 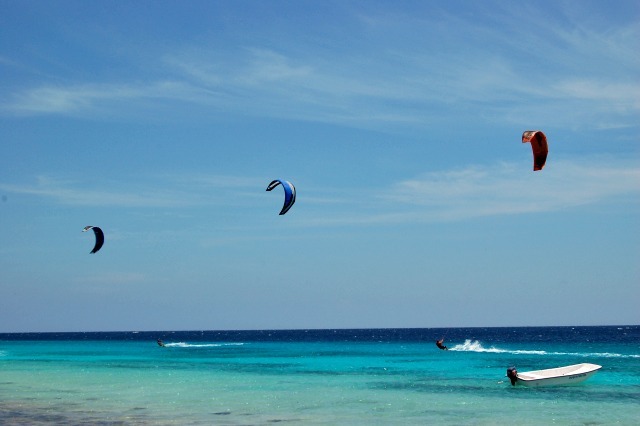 If you plan to kite or take kite board lessons the place to be is Atlantis Beach on the island’s southwest side, about five minutes drive south of Pink Beach. This arrangement works for everyone – kiters and windsurfers don’t have to worry about running into one another and kiters have plenty of room to spread out. They are often seen as far north as the little uninhabited island of Klein Bonaire. The kite conditions are offshore on the west side of the island which is better for safety. The atmosphere at the kite beach is relaxed and stress-free. Because the area of the island where Atlantis Beach is located is owned by the salt factory, there is no building allowed, and all kiting schools and food services are run out of trucks! Kiting is so easy to learn that you could take your first lesson and be practicing your first jumps before the end of your vacation. 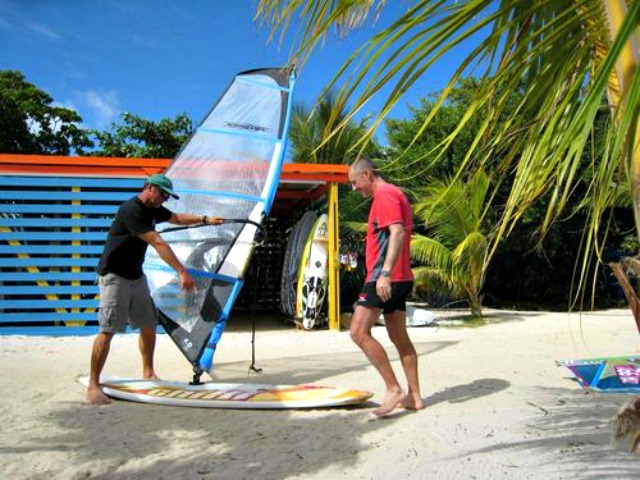 Lessons at Both Jibe City and Windsurf Place are a must for those that have never tried windsurfing before but if you really want to improve or even just go from novice to intermediate quickly, try a week of ABK windsurf camp. 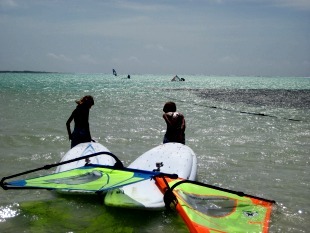 ABK Boardsports camps on Bonaire are hosted at Jibe City and last 5 days. This is an incredible way to vastly improve your skills in a fun, vibrant environment and meet lots of great people at the same time. Camps usually run through the winter and some years are offered in May and June as well, when the island is at it’s windiest. 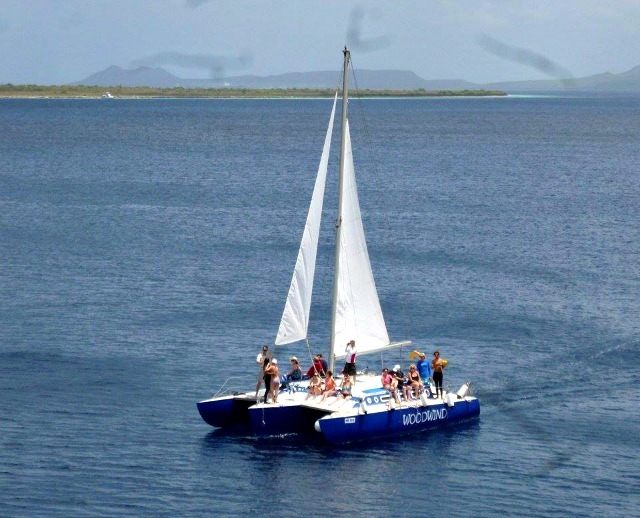 Woodwind snorkel sail is a fabulous way for sea and water lovers of all ages and abilities to experience the underwater aquarium that is the Bonaire National Marine Park. The boat Woodwind is a tri-hull catamaran that accommodates about 25 guests maximum. Most of the trips take you out toward the small uninhabited island Klein Bonaire (meaning Little Bonaire) where you drift from one snorkel spot to the next. Dee, the owner, and her crew provide everything you will need: all snorkel gear including prescription masks, full face masks with built in snorkel, fins of all sizes, sea skins, wetsuits, booties, swim vests, top-notch instruction on how to snorkel comfortably and safely, how to best enjoy the marine park, as much or as little information as you wish on marine biology and the ecosystem of the reef and so much more. The rescue trained crew genuinely care about the marine life they are lucky enough to get to share with their guests on a daily basis. Choose between sunset sails, lunch and dinner sails, three and four stop sails, etc. Drinks are unlimited, lunch is served. Additionally a photographer will be on board so your experience on the Woodwind can be captured with photographs or a video. One useful tip is to watch the schedule for cruise ship days/hours and book your trip on the Woodwind in advance to avoid crowded cruise ship days. Yes! This beach IS on the island of Bonaire and yes, this is what it really looks like. It’s our personal favorite but it takes a little effort to get here. Wayaka II is on the “long route” thorough Washington Slagbaai national park. And it’s nearer to the end of that route so if you don’t know it’s there you may end up missing it altogether after a long day of exploring other beaches and places of interest in the park. Wayaka II is also a popular dive site. This is a beautiful location for a swim or a snorkel before heading back out on the long dirt road that winds through to the exit of the park. Access to the beach is through a slightly questionable stairway and slippery rocks so watch your step going down. One more tip: On entrance to the National Park the ranger will give you a time that you must have exited from each particular beach in order to exit before closing time. After visiting Wayaka II you may want to leave time to visit Boca Slagbaai as well. That’s a completely different, larger beach not too far from Wayaka where it’s often possible for kids to catch some waves. 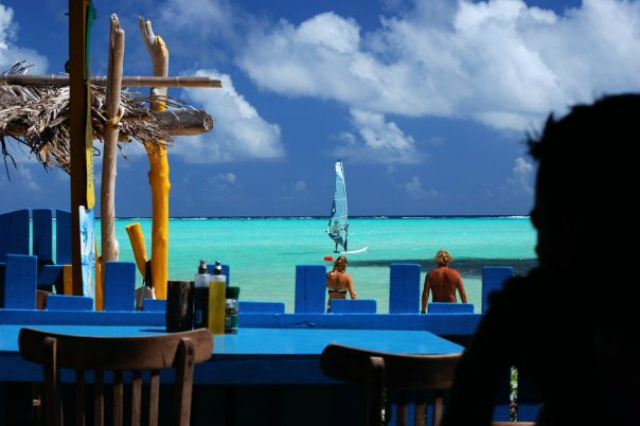 The on-again off-again restaurant in the National Park is also located at Boca Slagbaai. If it’s open definitely stop by for refreshments. There are still quite a number of wild donkeys to be seen on Bonaire but to keep the animals and humans safe the majority are now housed at the Donkey Sanctuary Bonaire which was originally formed as a place to help sick or orphaned donkeys. Taking a trip there for a look around is actually a lot more fun that it may sound at first. On your way in we recommend buying a bag or two of carrots at the gift shop to feed the donkeys during your tour – and if you don’t like the looks of this photo, we highly recommend rolling up those car windows! You can get out of your car and walk among the donkeys anywhere along the road or climb the wooden tower with viewing station near the entrance to the park. This short tour in the middle of nature feels strangely safari-like and peaceful. You can help the donkey sanctuary continue their important work saving the animals just by visiting, but you can also volunteer your time, or “adopt” a donkey for a year with a larger donation. The Donkey Sanctuary is easy to get to and very accessible just off the main road to Sorobon, Kaya Statius Van Eps. 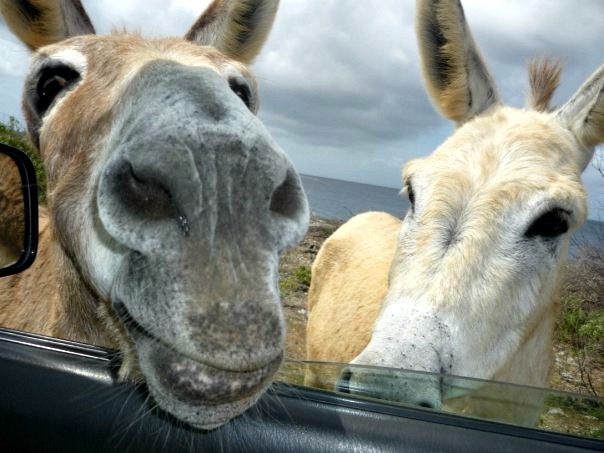 The Tour of the facility is simply in your own car but you can visit the foals and the injured donkeys near the entrance on foot while a volunteer gives you all the latest in Bonaire donkey news. We were joking about the big city but hopefully you knew that! Kralendijk’s (pronounced Kra-len- dyke) downtown area consists of only a few colorful and quaint city blocks. Here you’ll find lots of wonderful restaurants, some on Kaya Grandi, pictured above, and some on the road parallel to Kaya Grandi that is right on the waterfront. You’ll also find two gelato shops, a pharmacy, a realtor or two (or three) lots of jewelry shops with sea-themed jewelry, an art gallery or two, a furniture shop, some great clothing boutiques, a bookstore that doesn’t sell books, places to buy dive and snorkel gear, a bank or two, the post office… and that’s about it. Downtown is a great spot to cool off with a drink or an ice cream and do some people watching. On Fridays and days when cruise ships are in port there’s usually an art market in the square by the restaurant Cuba Compagnie. 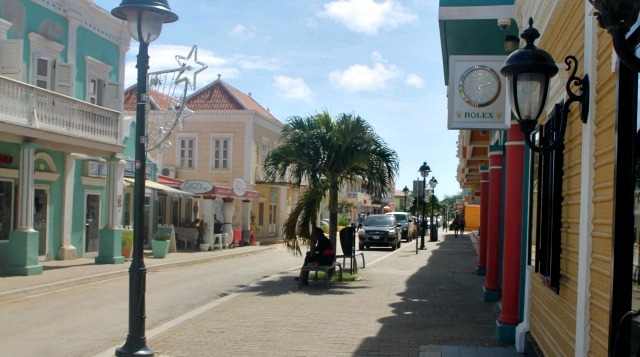 Visit downtown Kralendijk before leaving the island for gifts, postcards and souvenirs. What you won’t find? A traffic light. There isn’t one on the entire island. We are on island time! You can get to the downtown area from the apartments at Caribbean Court within about a 15 -20 minute walk or about 5 minutes driving. Parking downtown is free. We recommend checking the Bonaire cruise ship schedule and visiting downtown on a lazy day when no ship is in port.